What an experience this was! 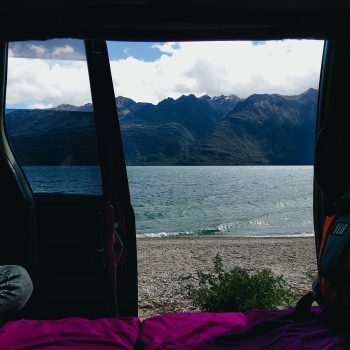 If you want to feel like a kiwi, free as a bird, you must camper van through your trip in New Zealand! It is a very beautiful country full of pristine nature sites and no dangerous animals that can kill you (unlike their neighbor Australia)! 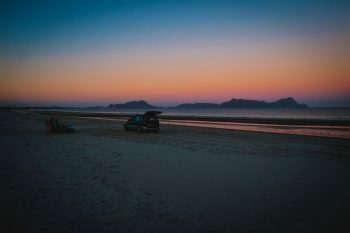 You’ll be driving through beautiful landscapes where they have made little park sites where you can pull over to park your vehicle when you get tired. You are free stop any where and bask in the beauty that is New Zealand! There are even random places that offer coffee on the side of the road, looking out for tired drivers. Pretty nifty, isn’t it? A random spot we stopped at on the side of the road on the way to Glenorchy! It is highly doable! The country is small enough to drive through. It’s actually smaller than California! You may start from the north island and drive to the south island. There are services that will ferry the car for you! You will be driving on the right hand side of the road and there are tons of roundabouts. Make sure to briefly read the basic driving laws in New Zealand before you go! 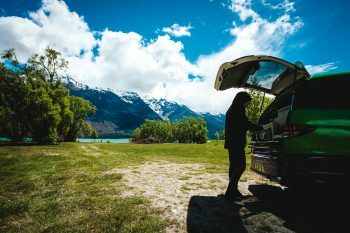 We flew into New Zealand during off peak-Season (early November), landed in Queenstown airport and walked around the many varieties of rental vehicle companies right inside the airport to find the best deal. We finally found JUCY Rentals and rented a “campa” through them for 2 weeks. It cost a little less than $100 NZD daily and came with insurance. You will be driving on the right hand side, so err on the safe side and pay for insurance just in case! Tip: Make sure to fly in during business hours, so you can catch these rental companies when they are open! 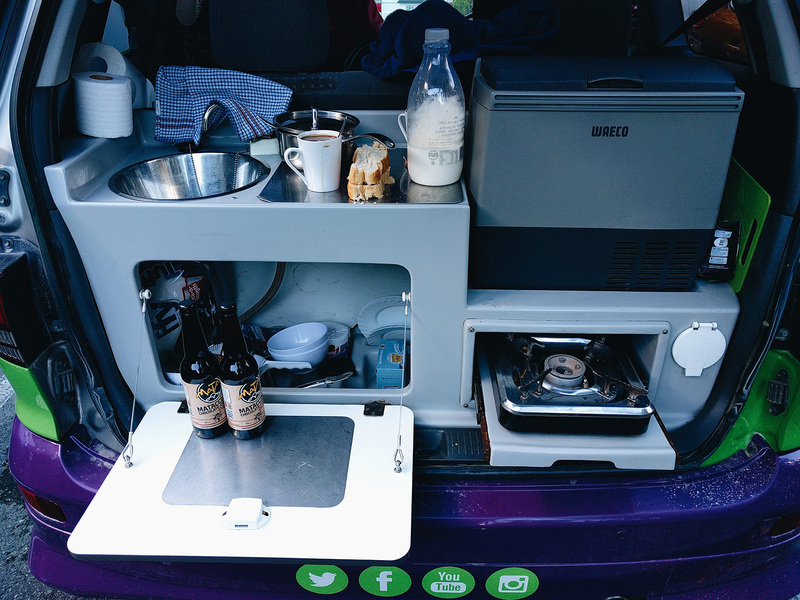 Also, if you are coming in during peak season, you will have to book ahead of time as camper vans do get booked out! a foldable bed behind the front seat – The chairs have been modified to fold into a bed! The storage underneath provides you with 2 pillows, a bed sheet, a comforter and 2 towels! You do have to push the front seats forward for your bed to fit completely, so you will be driving with the bed folded up. It takes about 5 seconds to get this set up so not a problem at all! a kitchen with a small fridge, a stove, and a sink in the back of the van – Your basic kitchen is complete with every thing you need to eat while you camp! It comes with water already filled up, a sink, a fridge, and 1 stove with 2 gas cans. In the back storage, you’ll find cooking materials such as 1 frying pan, 1 sauce pan, 1 spatula, 1 pair of tongs, 1 ladle, 1 soup spoon, 1 strainer, knives, forks, spoons, a cutting board, 2 coffee cups, 2 glasses, 1 dishwasher brush, a thin kitchen towel, you name it! You will have to buy your own cooking oil and of course, food, from the grocery store! 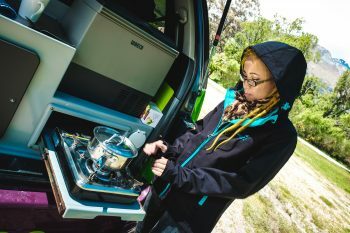 Download the app “CamperMate”. 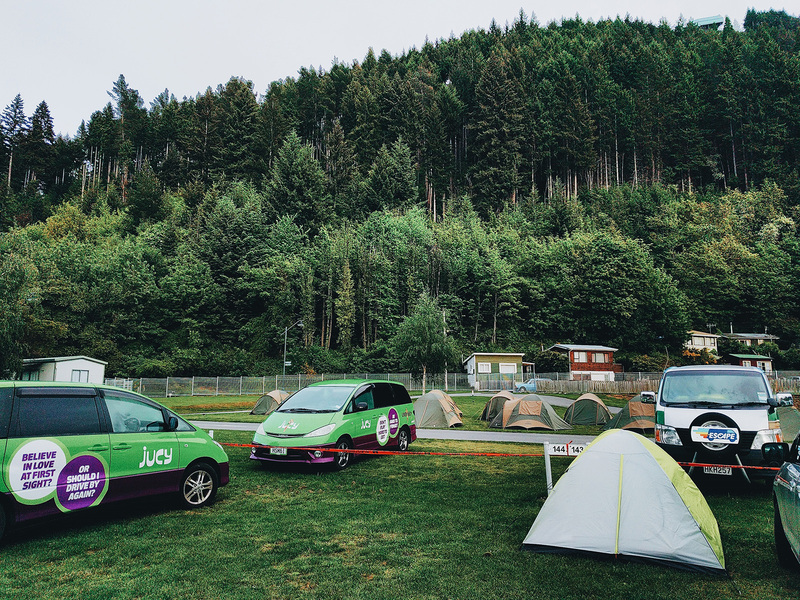 Here, you’ll find camping spots of all variety. For self-contained vehicles (RVs with its own bathroom and shower), for non self-contained vehicles (your campa van, or if you’re just using a tent, which does not have its own bathroom and shower), and many more. 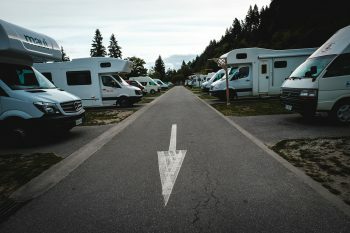 These camping spots can be as bare as being out on the beach with only a basic toilet, or they can be as glamorous as having showers, bathrooms, kitchens, laundromats, and rooms if you only rented a car. The most basic they are, the cheaper they are! Each campsite has reviews from other backpackers who have stayed there, and their phone numbers. 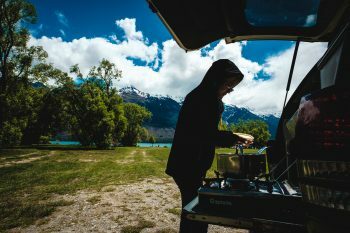 We finally took a chance at a basic camp site with no shower at the end of our trip, and we wish we did it sooner! We found Uretiti Beach Camp Site, and got to park our car right by the beach! Seeing the stars when it’s completely dark outside was magical! If you rented a 4×4 vehicle, you can even camp right on the sandy beach! Don’t have a 4×4 but wanna camp on the beach anyway? We found a group of guys from Scotland who were out there looking peaceful af during sunset. They were warned but allowed in through the car gates even without a 4×4, and they regretted it because they got stuck in the sand. I was jealous of their experience nonetheless. These camp sites sometimes close early! The front desk can close any where between 5:30pm-9pm, so if you’re driving around late like we did, make sure to find the camps that will let you in after office hours. They do allow you to pay the next morning when they open between 6:30am-8:30am. Everything in New Zealand has a switch. If you turned on the stove, and it didn’t get hot, chances are it wasn’t plugged in, or it is plugged in, but you gotta hit the switch to turn on the power! You may purchase laundry powder at most camp sites. It also costs about $3-$4 NZD to use the washer and dryer each. Most camp sites also have clothes lines where you can dry your clothes on if you prefer that option! Due to the earthquake and tsunami warnings, we unfortunately could not take the beautiful ferry trip to the north island. We ended up returning our campa van to JUCY at the Christchurch airport to Auckland, and they happily gave us a new campa van at the Auckland airport. If you are lucky enough to have this option, here are a few places you can book. We suggest booking them ahead of time. We didn’t experience them, so we wouldn’t have a review for you!